There are about 50 species in the genus Angelica. It is native to the temperate and sub-arctic areas of the northern hemisphere, with some species growing wild as far north as Lapland and Iceland. The genus includes perennial and biennial plants. Archangel has been valued traditionally as a healing plant. Some authorities suggest that its "angelic" healing powers are the origin of the common name. The plant was part of pagan spring festivals and later the Christian festival of the Annunciation. One legend tells us an angel appeared in a dream and announced that Archangel could cure the plague. The plant was sometimes associated with the archangel Michael, while in other places it was called the "Root of the Holy Ghost". Angelica archangelica grows about six feet tall. It has large bipinnate leaves and a hollow stem. 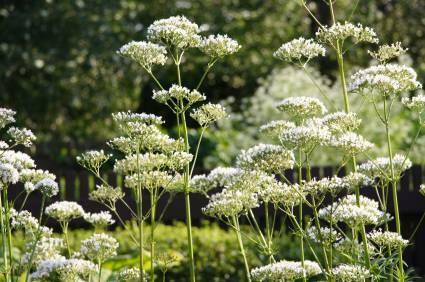 The flowers form a white or greenish-white compound umbel. Other species and cultivars may have purple umbels. Archangel blossoms in July and August. Flowers are followed by pale yellow fruits, 1/6 to 1/4 inch long, from August to September. Archangel is pollinated by insects, but the plant can self-fertilize. It dies after fruiting. Garden Archangel is hardy to zone 4, and some other species are even hardier. The roots are long, spindle-shaped, and fleshy, with many descending rootlets. The largest ones can weigh up to three pounds. All parts of the plant have a pleasant, aromatic scent. Archangel likes a moist, fertile soil and tolerates a pH range from 4.5 to 7.3. It thrives in light or dappled shade to full sun. Plants should be spaced about three feet apart. This is a tough plant, and it may grow and flower under less than ideal conditions. These plants are reliable perennials if they are prevented from setting seed. Frequent deadheading is strongly recommended for ornamental plants. Archangel will self-sow readily under suitable conditions. Seed has a short period of viability, and should be sown in a cold frame or in the garden as soon as it is ripe. If seed must be stored, keep it in a sealed plastic container and store the container in the refrigerator. Light is required for germination. Seedlings transplant readily although older plants do not like to be disturbed. Archangel is rarely troubled by pests and diseases. Ornamental Archangel is often grown in woodland gardens or partly shaded borders. It is attractive to bees and hoverflies. The leaves, root, stem, and seed of all Angelica species are edible. However, they do contain furocoumarins, which increase the sensitivity of skin to sunlight. Leaves are used in salads or cooked. Stalks can be peeled and used like celery or candied. The seed is used in flavoring gin and liqueurs such as Chartreuse. Medicinally, Archangel has been used as a stimulant, tonic, and expectorant. It has displayed antimicrobial properties. The plant has been used to treat rheumatism, toothache, skin rashes, wounds, and fever.